While Android Auto and Apple’s CarPlay are slowly making their way into the automobile industry, the biggest constraint with these technologies is that mostly, it has to be implemented by the manufacturer themselves. While there are third-party solutions for the same, they are quite low in numbers. Now, in terms of voice assistants, Amazon’s Alexa is certainly on the top. We’ve already covered how the service is coming to smartwatches, fitness trackers, microwaves, and even bathrooms. And now, with Anker’s newly unveiled car charger at CES 2018, Amazon Alexa is all set to add smarts to your car as well. 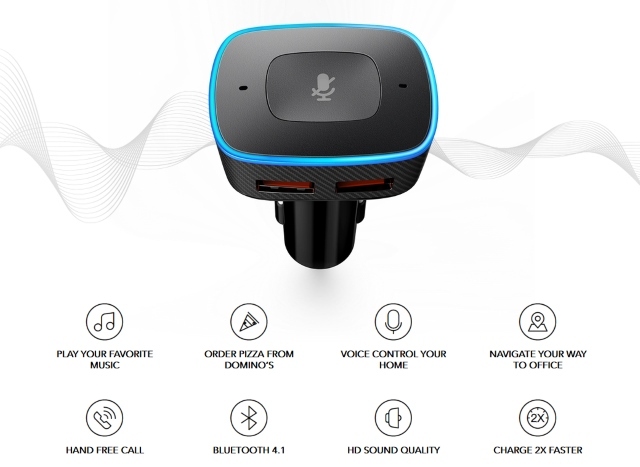 Named the “Roav Viva”, the Bluetooth smart charger gives you access to the voice assistant by connecting to your car. Similar to the Garmin Speak, the charger is compatible with any vehicle that has a system with Bluetooth 4.0 A2DP technology built-in to it. Considering that this Bluetooth technology has been around since the early 2010s, there’s a high chance that your vehicle does make use of the same. Apart from charging your mobile devices, like a normal car charger, you can use the embedded Alexa AI to perform a plethora of tasks. Amazon’s Alexa can be used for checking the weather, listening to music via iHeartRadio or TuneIn Radio. You can even use your preferred Maps service to search for directions. All this, at almost 1/4th the size of your regular Amazon Alexa Dot. Furthermore, the charger has 2 PowerIQ equipped charging ports that intelligently detect and deliver the optimum charge to any device. While the Garmin Speak does offer similar Alexa capabilities, it costs you a staggering $150. On the other hand, the Anker Roav Viva will be available for a mere $50, when it goes on sale later this month, standing at the same price as a regular Alexa Dot but at a quarter of the size. In my opinion, if you’re looking for a smart solution for your car, but don’t want to go about spending a lot of money, Anker’s Roav Viva is a great option for you. And it makes all the more sense if you simply want to try out smart car features without spending a fortune on a new set of wheels.